5.1 How can I stay up to date with news and updates on the fCommerce Go application? 5.2 The tab doesn't appear on my pages. Why? 5.3 How can I rename the tab? 5.4 How can I track orders placed from Facebook? 5.5 How do I change the tab name and the picture? 5.6 How do I make a third party addon working with fCommerceGo? 5.7 How do I test connection between my X-Cart store and fCommerceGo? 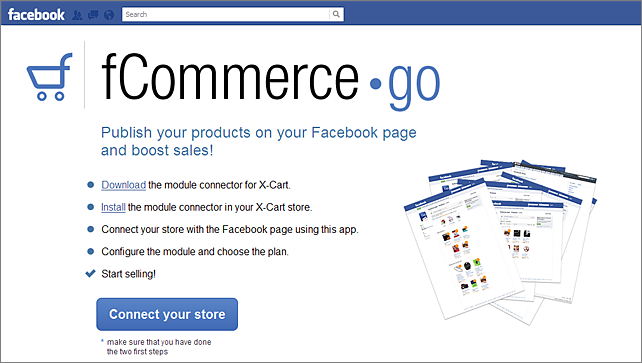 With fCommerce Go, you can add your X-Cart based store to your Facebook page with just a few mouse clicks. Millions of users all over the world literally fell in love with Facebook; some have made Facebook their browser’s home page. For others it’s the only place online they would visit during an entire day. So, bringing your products to their target audience by simply adding a storefront to your Facebook page is a way to boost your sales effortlessly and cheap or totally free: just message your friends or buddies who have liked your FB page with the storefront tab. Finally, you can take advantage of Facebook Advertisement, which costs just a few cents. On top of that, a storefront on Facebook allows users to shop for their favorite products, share their thoughts and leave comments without leaving their favorite the Facebook website and thus build up a community of happy customers advocating your brand all over the Net. It builds community around your brand. It saves promotion and marketing money. Starting with X-Cart version 4.5.3, fCommerce Go is available as a built-in module in all X-Cart editions. It does not require installation and can be enabled in the Modules section of X-Cart Admin area. For X-Cart versions 4.1.0-4.5.2, fCommerce Go is available as an add-on module which can be purchased separately. 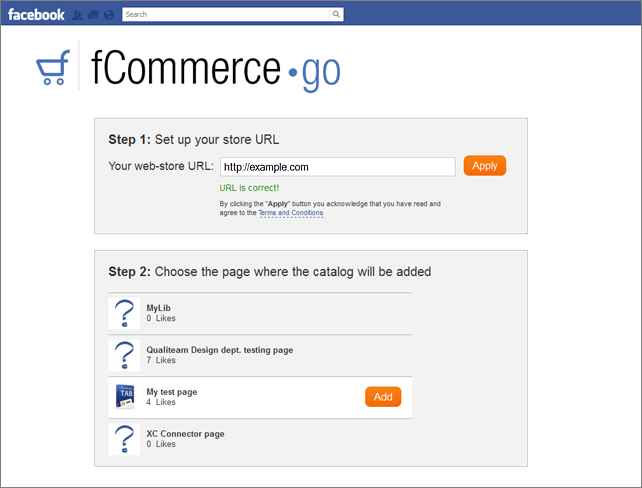 The instructions below will guide you through the process of installing the fCommerce Go add-on module in your store. To be able to successfully install and use the fCommerce Go module, you need a working copy of X-Cart GOLD or PRO v4.1.0-4.5.2 installed on your server. Note: If you do not remember the version of your copy of X-Cart, you can find it in the Environment info section of the Summary page in X-Cart Admin area. 1. Sign in to your Qualiteam Account. 2. In the File Area section, find the fCommerce Go distribution package and download it to your computer. The distribution package is archived in the file fcommerce-xcart-x.y.z.tgz, where x, y and z indicate the version of the module. Make sure the version of the module matches the version of your copy of X-Cart. For instructions on upgrading to the latest version, please refer to fCommerce Go Upgrades. For instructions on installing fCommerce Go manually, please read fCommerce Go Manual Installation. 1. Copy the distribution package you have downloaded to the X-Cart root directory on your server or hosting account. a) Extract the contents of the archive with the fCommerce Go module files to a directory on your system using your favorite compression program (WinZIP or any other archiver that supports TAR files). b) Use an FTP client to upload all the files extracted from the archive (retaining the directory structure) to the X-Cart root directory on your server or hosting account. a) Use an FTP client to upload the archive with the fCommerce Go module distribution package to the X-Cart root directory on your server or hosting account. Important: Make sure to maintain the directory structure while unpacking and uploading the distribution package; otherwise, some critical files can be overwritten! 2. In a web browser, run the installation script at httр://www.example.com/install-fcommerce.php, replacing the variable www.example.com with the real domain name, where your X-Cart is installed. 3. Enter the Auth code, accept the License Agreement and click the Next button. 4. The installation script copies the files and activates the module. Click the Next button to continue. 5. The installation script generates a new system fingerprint. Click the Next button to complete the installation. Note: In certain server environments, the module could fail to install properly due to incorrect initial permission settings. Follow this instruction only if you would like to remove the fCommerce Go module from your store. 1. In a web browser, run the installation script at http://www.example.com/install-fcommerce.php replacing the "www.example.com" with the real domain name, where your X-Cart is installed. 2. Choose the Uninstall the module option, enter the Auth code, accept the License Agreement and click the Next button. 3. Once the installation script has removed the fCommerce Go module files and deactivated the module, click the Next button to complete the uninstallation. 4. On the Uninstallation complete screen, click Next to leave the Wizard. Important: After you have uninstalled the module, make sure to remove the module's distribution package from your web directory as well. 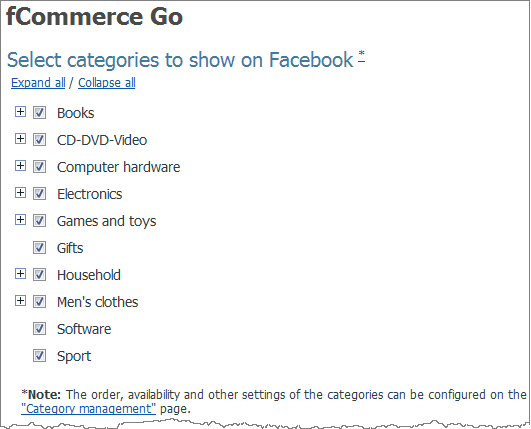 To set up fCommerce Go, enable and configure it in X-Cart and then add the tab to your Facebook page. Once you have installed the fCommerce Go module, enable it in the X-Cart Admin area. 1. Log in to the X-Cart Admin area and go to the Modules section (select Settings -> Modules on the administration menu). 2. On the list of modules, find the "fCommerce Go" item and select the check box by the item's name. 3. Scroll down to the bottom of the page and click the Apply changes button to apply the changes. 1. Log in to the Admin area and open the Modules page by selecting Settings -> Modules on the menu. 2. Scroll down until you see the fCommerce Go item and then click on the Configure link by the item. This opens a page with options and settings for the fCommerce Go module. 4. Select the categories to be shown on Facebook. 5. Adjust the settings in the Advanced settings section as necessary. Show bestsellers on home page - toggles the bestsellers module on the home page. Show Featured products on home page - toggles the Featured products module on the home page. 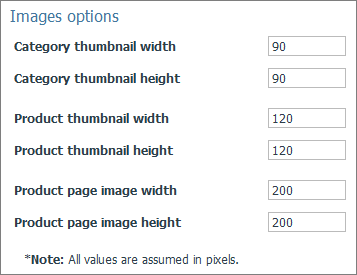 Show category thumbnails - toggles category thumbnails on the home page. For general visitors - customize your welcome message to new visitors. For people who liked your page - customize welcome message for your fans (optional). Note: Leave these settings as default unless you know for sure how you are going to change them. Adjust image options. Image dimensions are set in pixels. 6. Click the Apply changes button to save changes. 1. Make sure that you use Facebook as personal profile by turning off the "Facebook as Page" feature when associating pages with fCommerce Go. 2. On the fCommerce Go application page, click the Connect your store button. 3. On the application authorization page that appears, allow fCommerce Go to publish its data on Facebook. 4. 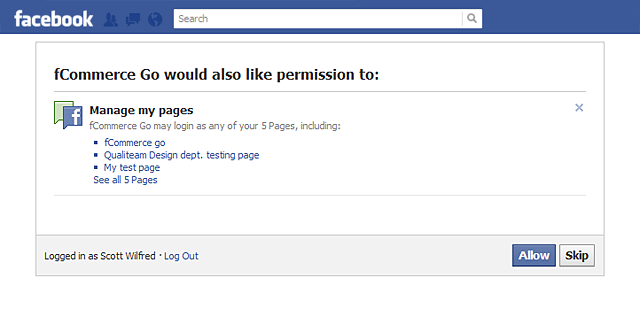 On the permissions page that appears, authorize the application to use your Facebook pages by clicking the Allow button. 5. On the fCommerce Go setup page, enter your web store URL and then click the Apply button. Note: Make sure that the fCommerce Go module is already installed in your web store. 6. 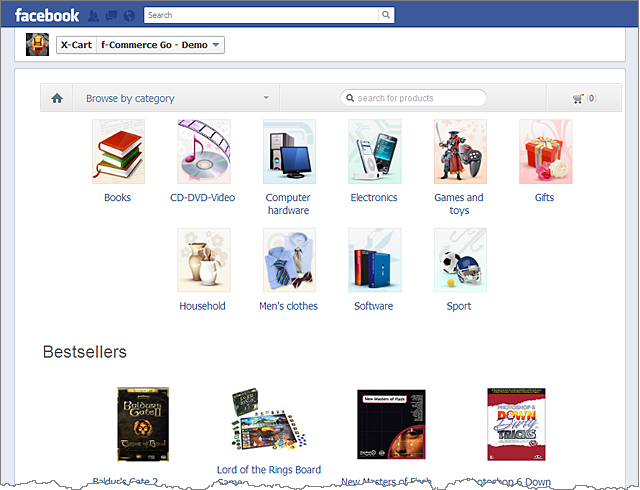 Select the pages on Facebook where the catalog is to be added. 7. Once the pages are set, you can view the page with the catalog by clicking the View page button. How can I stay up to date with news and updates on the fCommerce Go application? 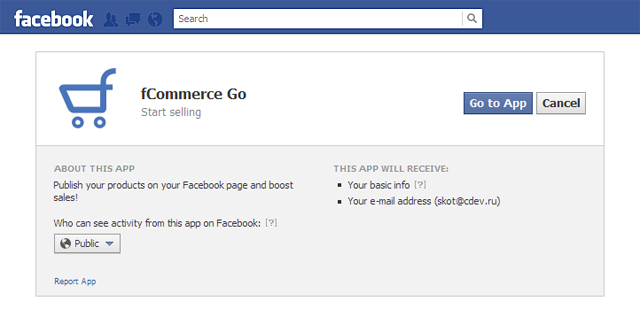 We post all the news about the fCommerce Go module on the application profile page on Facebook. If you want to get e-mail notifications of all the posts published on that page's wall, just click the "Like" button on that app-profile page or on the canvas page of the application. The tab doesn't appear on my pages. Why? Make sure that you are adding the products tab to community or business pages, and your pages are listed in "The pages where X-Cart products tab is already added:" section of the FB-application. If the list is empty, it means that the tab isn't added to any of your pages. However, if the list is not empty, and the tab still fails to appear, click on the "Edit page apps" link of the required page. Then find the "X-Cart Shop" application in the central area and then click on the "Edit settings" link. Now, add the tab in the popup box that appears. In this popup, you can also rename your tab. How can I rename the tab? Click on the "Edit info" link on your community page and then select the "Apps" link on the menu at the left. Find the "X-Cart Shop" application in the central area and then click on the "Edit settings" link. In the popup box that appears, enter the desired name and then click the "Save" button. How can I track orders placed from Facebook? You can track the sales using X-Cart's standard "Orders search" feature. 2. Click the "More search options" link. 3. Select the "Orders with products added in Facebook" item on the "Order features" list. 4. Configure other search options as necessary. Moreover, even if orders are searched without that option selected, all the found records that contain products added on FB will be marked with a blue "F" label. How do I change the tab name and the picture? 1. Open your FB-page settings (Admin panel -> Manage -> Edit Page). 2. Select the "Apps" item on the menu to the left. 3. Find the "fCommerce Go" record on the "Added apps" list. 4. Click the "Edit Settings" link under that record. The settings include: Tab (remove), Custom Tab Image, and Custom Tab Name. Feel free to change them as necessary. Just a quick recommendation on tab image: prepare a suitable image with the 111x74 px size prior to performing the replacement. How do I make a third party addon working with fCommerceGo? 1. Edit the "modules/fCommerce_Go/third_parties.php" script. How do I test connection between my X-Cart store and fCommerceGo? where http://www.example.com/xcart/ should be replaced with your actual X-Cart's URL. This page was last edited on 27 February 2019, at 13:34.